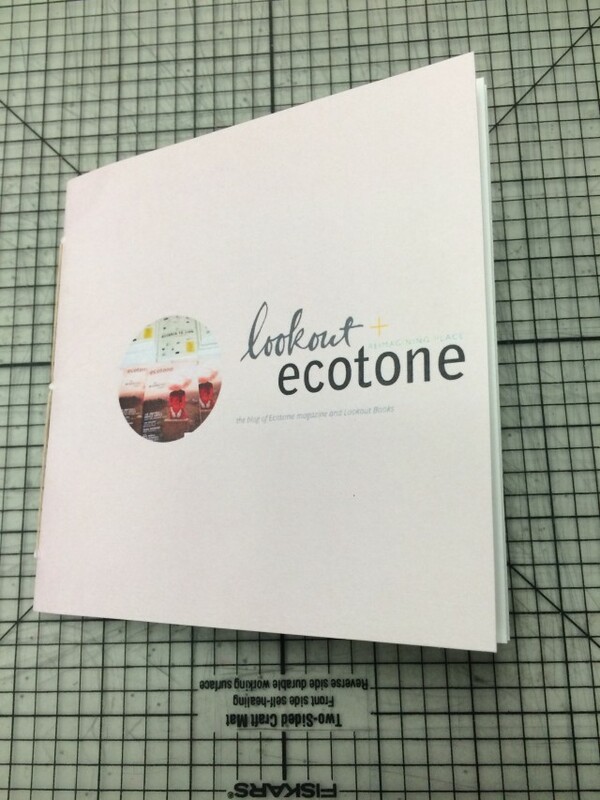 Undergraduate and graduate students enrolled in Book Building courses here at UNCW learn how to design, print, and bind their own chapbooks. They can use our perfect binder (cranky as she sometimes is), which holds pages together with hot glue, or they can stitch their books together with needle and thread. You probably don’t have a perfect binder like we do, but maybe you can think of a loved one who deserves a handmade book just the same. 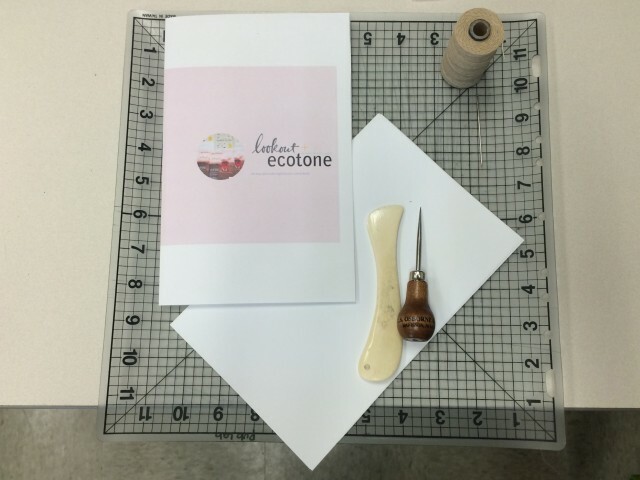 So we thought we’d share this step-by-step guide for creating your own chapbook and using the three-hole pamphlet stitch to bind it (sans, of course, the sentiments you will use to fill its pages–that’s up to you). 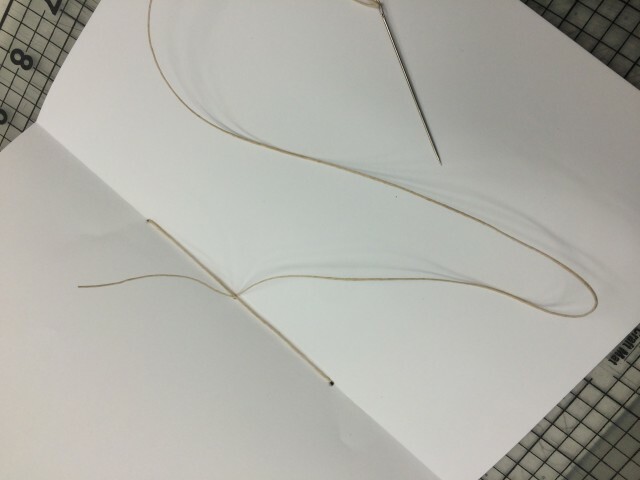 Paper for the interior: As many sheets and any type of paper that you want, but know that the more pages you include, the harder it will be to thread. I’m using 20lb white letter paper. Paper for the cover: One sheet the same size as your interior paper. You can decorate the cover with stamps, stickers, photographs, or anything else you like. I’m using 110lb white letter paper so the cover is heavier and thicker than the interior paper. Thread: While the Pub Lab prefers waxed thread, you can use any thread you’d like. The thread will be visible on the spine of the book, so think about how the color will complement your cover when you’re picking out thread. Fold all of your paper in half. 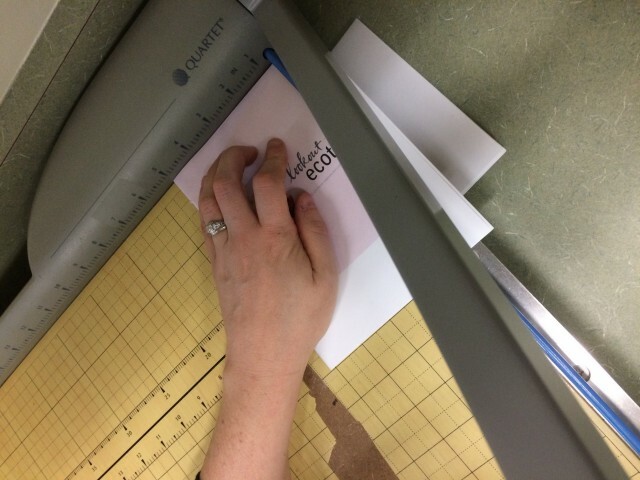 You can fold each sheet individually, or fold them all (including the cover) together. 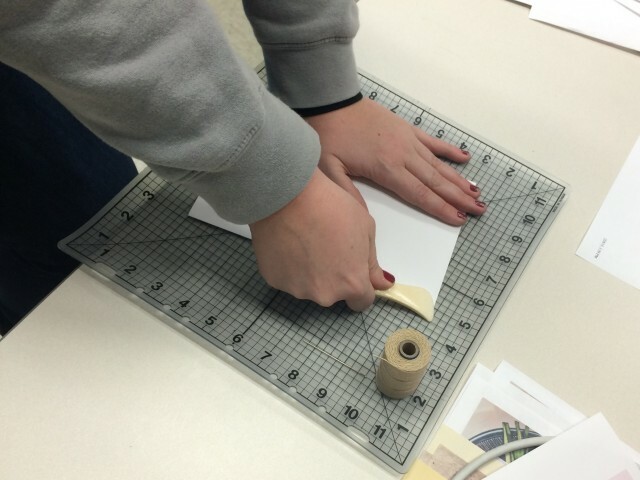 Folding each sheet separately gives you a crisper fold, especially if you use a bone folder to make a defined crease, but folding all of the sheets together will create a nice nested look for the pages while rounding out the spine. For this book, I folded all of the interior pages together, but folded the cover separately. Thread the needle. Don’t tie a knot, just leave a little tail. 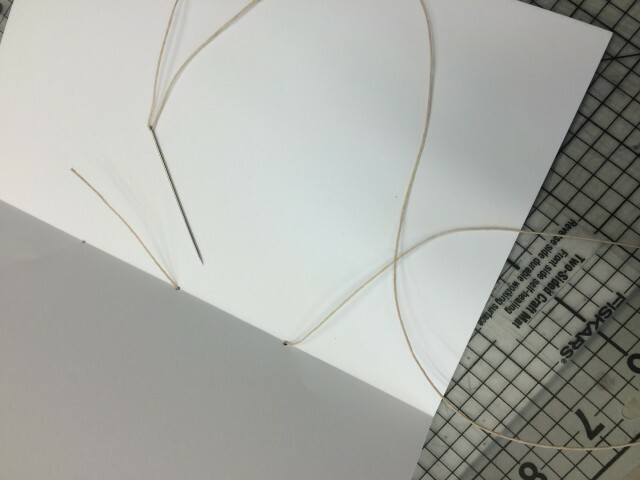 To start stitching, work from the inside of the book. Pull the needle through the middle hole almost all the way, leaving yourself a bit of thread that you’ll use later to tie off the binding. 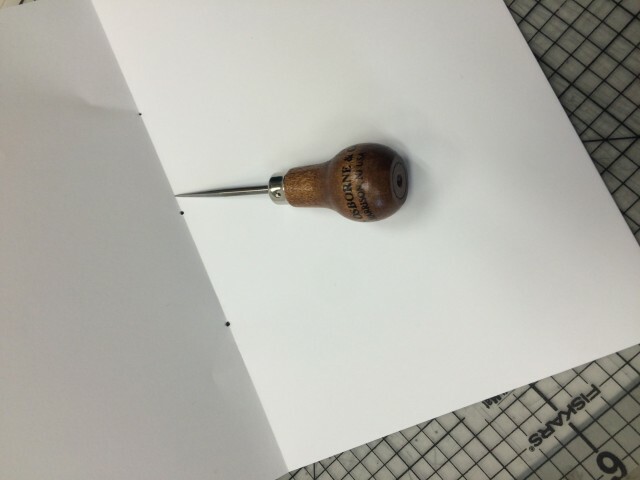 Then, bring the needle through the bottom hole from the outside to the inside, pulling tight. Skip the middle station and pull the needle through the top hole from the inside to the outside, again pulling tight to get rid of any extra slack. 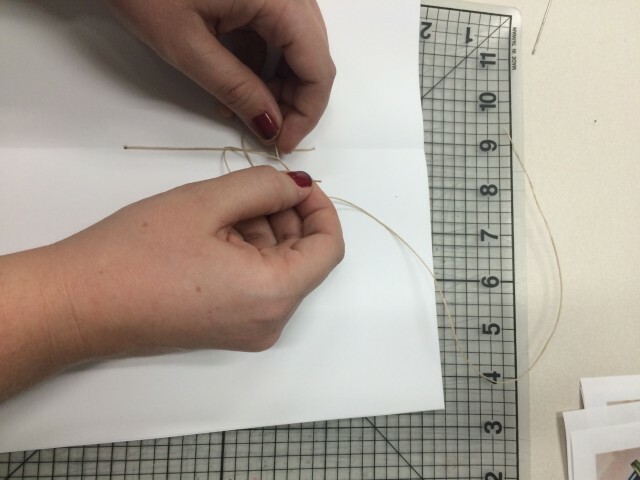 Making sure that your needle is on the other side of the thread from your first pass through the middle, come back through the middle hole from the outside through the inside. You’ll be tying the knot around the thread, so you want the end pieces to be on either size of the thread. Also, be careful not to pierce the needle through the thread, as this will cause it to fray. Pull the string taut, then ie a double knot, or square knot, in the thread. Again, make sure that it goes around the middle string. Then, cut the excess thread, leaving a little bit so the knot doesn’t come undone. Flatten the paper under some heavy books for over thirty minutes, which prevents the edges from curling. 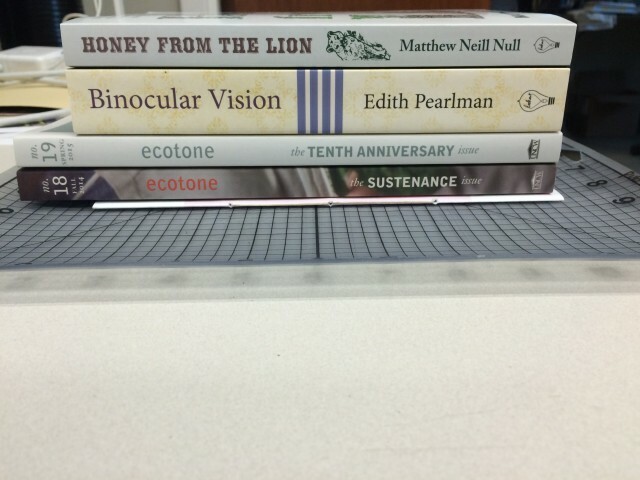 I recommend using your favorite Lookout titles and Ecotone issues, but the books are up to you! 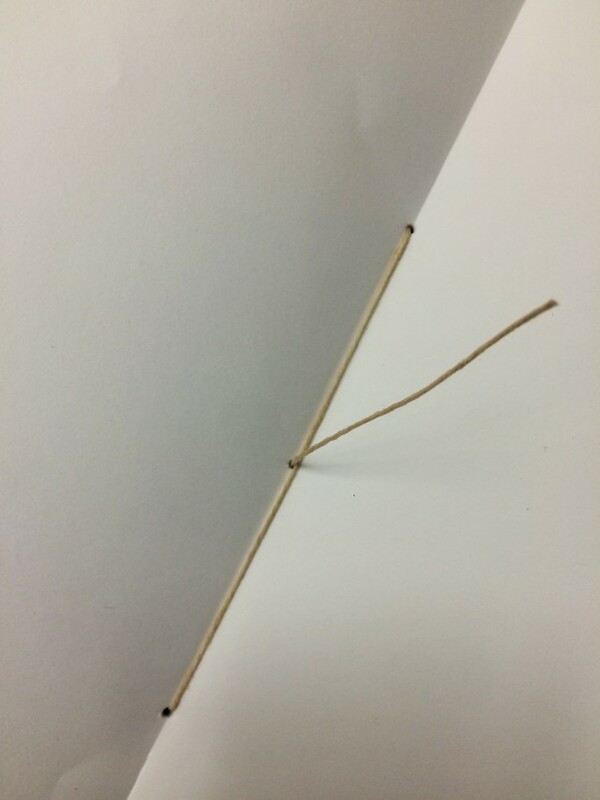 Trim the excess from around your book. 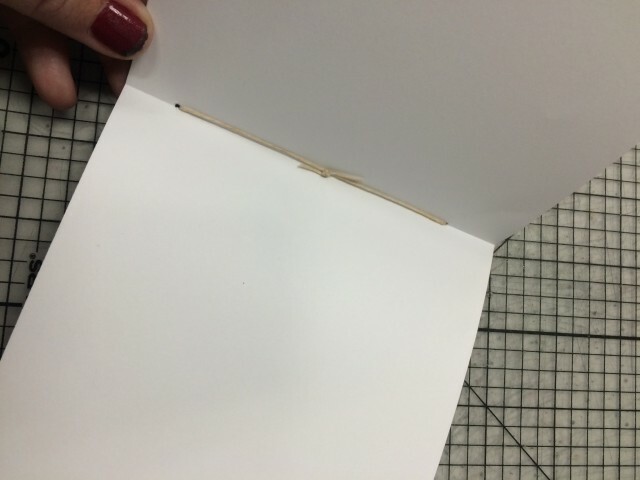 If you started with paper the exact size you want, this may be just trimming the right edge of the book to make the pages even. If your book is smaller than the paper, you’ll need to trim all three sides. At this point, your book is complete. You can put it under more books if it’s not as flat as you would like, or you can place it directly into someone’s stocking or gift basket.